Summary: We’ve reached a critical point in this business cycle. We enjoyed the years of fiscal and monetary stimulus; now comes the dismount. Only after the stimulus ends will we learn the true strength of our economy. Today we look at the monthly jobs report, perhaps the single most important indicator. Three graphs tell the story, cutting through the fog of confusion spread by the news media. Reports about the monthly jobs report illustrate why we’re confused and so often ignorant about important aspects of our lives. We get numbers without context. Raw numbers by themselves tell us little; the percent change has meaning. Also useful are descriptions of the trend and adjustments for inflation (vital when looking at long-term changes). We get detailed analysis of noise, lavish attention to tiny monthly fluctuations — changes usually smaller than the data’s error bars. Instead let’s focus on the big things. Three graphs tell the story about the September jobs report. I have been showing readers these numbers for years. The first big story is that these trends have not changed. Before we start, remember the price paid for this expansion. Five years of near-zero interest rates (since December 2008) — ending in Q2 or Q3 of 2015). Three rounds of quantitative easing — ending this month. And an mind-bending expansion of the Federal public debt — $809 billion added during the fiscal year just ended (a 6.8% increase, equal to 4.7% of GDP). That the economy needs such large stimulus in the sixth year of an expansion is unprecedented (usually by now the economy has overheated from too-fast growth) — and is the second big story. Now comes the dismount, when we must dial the stimulus down to zero. Understanding the trend helps us prepare for what might happen next. Steady slow growth at about 2% now in its fourth year. We’re not in a recession. No signs of the often-predicted acceleration. The percent of people in their prime years (16 – 64) who are employed peaked in 2006, fell in 2007 – 2011, and has only weakly recovered since then (back to the level of 1984, reversing much of the long increase from women entering the work force). There are many factors affecting this, but the trend since 2006 probably reflects weakness not strength in the US economy. For several years conservatives have confidently predicted that the economy would soon overheat — with wage inflation coming! We wish it were so — that employers would share their record high profits, resulting from decades of productivity gains. Here’s a rough estimate of YoY changes in the average American’s real wages: hourly earnings for private sector production and non-supervisory workers deflated by the CPI of urban wage earners. The bottom line: workers real wages fell for two years. Since the start of 2013 they’ve grown slowly. Very slowly. No signs of the often-predicted acceleration. This is bad news when occurring so late in an expansion. If we’re not getting strong real wage growth in the fifth year of an expansion (i.e., an old expansion), we might not get it before the next recession. See all posts about economics. 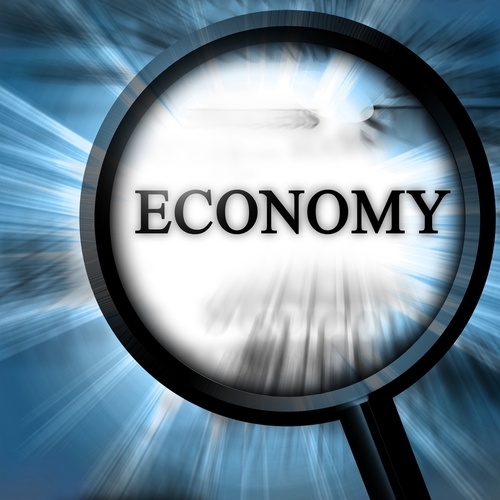 Next Post Look at the economy. Fight the illusion of normality. Feel the weirdness. Is it perhaps meaningful that the per cent employed during the 1960s was lower than any time since the mid-1970s—and we typically think of the years from about 1945-1970 as our nation’s best times, economically? I could be missing subtle (or even not-so-subtle) points, but I would expect that as technology advances, the ratio of total working hours per year to population would decrease: it should take less effort to produce what the same number of people need, and even though our standard of living would be increasing, that shouldn’t take up all of the gains. Yet what I see is that where a single wage earner per household was once enough, now it’s hard to get along without two—or a single head of household struggling with two or three jobs. And apparently many jobs above the median now expect workers to give far more than forty hours a week (whether in the office or elsewhere, using computers and smartphones). It seems to me that the obvious conclusion from all of this is that wages are far too low—and too many people are trying to work too many hours because of it, thus maintaining unemployment and keeping wages low. I do wonder how we might fix that, though. Even if we could somehow manage the political will to force a change domestically, we couldn’t maintain it alone in a global economy without abandoning our free trade agreements and becoming strongly protectionist. Yet, I don’t see what else could reverse this economic trend, which is destructive and punishing for the great majority of Americans. Normative statements like this are inherently problematic — always. Our plutocratic rulers — and their horde of libertarian followers — probably disagree. They have worked hard for two generations to bring about our current situation — a comfortable reserve army of the unemployeed, profits at near-record high fraction of GDP, income and wealth concentrations back to their Gilded Age levels, and bipartisan politics (i.e., both parties serve them, their money dominating elections). Perhaps you imply that the rest of us should be unhappy, and seek to change today’s conditions. I’ve written scores of posts about that very thing. But so far as I see, only a tiny fraction are willing to act. How to increase that number is the question of our age. “Our plutocratic rulers — and their horde of libertarian followers — probably disagree.” Oh, brother. E/FMB has jumped the shark. Can you explain that statement? A large body of evidence supports my statement, so “rebuttal by snark” is inappropriate. Althouugh I don;t identify as a Libertarian, I feel they are unfairly singled out for criticism in this response. The left is far more culpable. This is OK but its actually worse if you add in the Farm Self Employed and the Military which they do not count. One new meme I’ve seen asks the question whether we will have a creditor lead debt default or a debtor lead default. So far the deleveraging has been creditor lead with attendant asset stripping by creditors. A debtor lead process would have more bankruptcies with a more even handed sharing of the pain from making foolish loans. In a way this could become the core issue of our time as the debt problem enters its final denouement. No sure where you’re getting the additional debt number, but from Debt to the Penny, a .gov site, we added 1,085,890,854,026.50 in new debt in the recently concluded fiscal year. Of course, to whatever ruling party is in power, debt is meaningless; from the opposition party, no meaningful ways to cut it are offered. You are looking at gross debt, including intergovernmental loans (the right pocket lending to the left pocket). I stated that this was the *public* debt. Internal loans have zero effect on an entity’s solvency or cash flow. Debt analysis should be done using only net debt (excluding loans to myself by me). Public debt is the closest the U.S. Government comes to publishing this (it includes loans to government obligations such as pension funds). I see the distinction, but the fact is that intragovernmental number NEVER goes down (it’s grown 66% in 10 years), and that when the time comes to pay it back, new debt will need to be issued, since it’s likely surpluses to pay it back won’t materialize, making the public the new holder of that debt; might make sense to call it Eventual Public Debt, and in fact, the .gov site does include intragovernmental debt in its “Total Public Debt Outstanding”. Looking at internal credits and debts is easily shown to be absurd. Write yourself a check for a billion dollars. Your balance sheet now shows a credit for $1B, and a debt of $1B. Has anything changed? Coises may have forgotten one of the great wage thefts perpetrated by modern employed after WW II. Up to roughly 1970, one income sufficed to support a middle class American family. After about 1970, women began to enter the U.S. workforce in massive numbers. Today, in 2014, two wage earners are now required to support a basic middle-class lifestyle. Consequently the ratio of total working hours per year to population has at least doubled post-1970, since only the husband typically needed to work to support a family pre-1970, while today both husband and wife must work to support the same middle-class family. As FM has pointed out, our rulers have arranged the U.S. economic system so that no matter how much technology advances, the middle class no longer reaps the gains from productivity. A large part of this scam involves increasing workers’ hours even as productivity skyrockets. If I am mis-using the term, FM can correct me, but rampant corporate fascism certainly plays a big role in the spending/debt problem. The site fedspending.org has a database where one can cross-reference which firms have contracts with which gov. agency/department. Here are 2 examples for fiscal year 2011 (assuming their data is accurate). EPA contracts (ranked by $$) — 200 firms have contracts of at least $1 million. Doing the same for other agencies produces similar mind-boggling results. Another way of looking at it, Lockheed Martin has deals (of anywhere from 7 to 9 figures) with the likes of Customs Service, NIH, Forest Service, Census Bureau, SEC, OPM, etc. Just as above, this list goes on, and on, and on. I have no doubt that each of these firms has its army of lobbyists making sure that any piece of legislation affecting any of these agencies keeps the gravy train of gubmint money flowing, and that they use however much $$ is needed to get the “right” politicians re-elected. And the corporate-owned media certainly has a vested interest in making sure the electorate is NOT well-informed on all this. I don’t see how the existence of these is inherently bad, or that they’re less efficient per dollar than having the government directly provide these goods and services. Privatization has its place, although not the panacea conservatives claim. Also, both direct government spending and via private corps are vulnerable to corruption. I would be interested to see studies showing if one was more so than the other. I don’t believe the form of ownership matters. Is the Washington Post a better firm if owned by plutocrat Jeff Bezos than by one of the giant media corps (e.g., Gannett or News Corp)? I agree that the answer is “no”. But why is, as usual, the key question. Are we better informed than we want to be? Is there a market niche for accurate impartial detailed news? These questions are above my pay grade, but I’d be interested in seeing an expert answer them. (1) To me it means government in cahoots with business at the expense of the people. a) “Big data” gathered and shared by both for surveillance purposes, gathering as much of our private info. as they can, ostensibly for marketing. b) “Regulatory capture” and the revolving door, where regulators come from, and afterward go back to, the firms being regulated. See banking, pharma, cable industries for examples. Whose interests are these people looking out for? (2) The lobbying impact I mentioned. When it comes to spending at a given gov’t. agency, all that matters is what’s best for the firm’s bottom line. Tangentially, for “well-connected” firms like Blackwater and Halliburton, was it just a happy coincidence (for their bottom lines) that the Iraq war dragged on as long as it did? (3) Virtually all of MSM’s parent firms have at least 1 member on their board of directors who have a Wall Street pedigree. These are media, not finance, firms. In my experience at least, way too many people have been led to believe that the whole global financial crisis was caused much more by “liberal housing policies”, than by U.S. and Euro investment banks. Dare I ask, who benefited from the crisis? (4) I think that as long as we have Dancing With The Stars and NFL football (with all the legalized gambling known as fantasy football that keep the t.v. ratings through the roof), and the transfer payments keep coming in, virtually no one cares what gov’t. does. You raise many interesting points! I am running out, so just one quick point… Fascism refers to specific political system. It is not a synonym for “bad”. This is silly. GDP is one number, one metric. I don’t know who these people you think have a “fetish” about it, but they’re not economists.